Autumn leaves are falling, the nights are closing in and Halloween is creeping towards us. According to pagan folklore, All Hallows’ Eve is a time when the veil between our world and the spirit world is at its thinnest, allowing spirits and ghouls to cross over. A tradition based on Samhain, an ancient celebration to mark the summer’s end, and a time to remember the dead. Today we use fancy dress and make pumpkin lanterns which mimic times past, where people would don their clothes inside out and place jack-o’-lanterns in their windows to keep bad spirits away. Modern Halloween has become a time of fun and celebration, a day of tricks and treats and cheap thrills. However, after the celebrations are over, we are left with a lot of unecessary waste, most of which, unfortunately, ends up in landfill. Times are-a-changing, we live in a world where global waste, pollution, and climate change are all issues that are going to haunt us unless we change our ways. So, in the spirit of sustainability and responsibility - here are some suggestions as to how you can ‘green’ your Halloween. Did you know that 64% of people don’t use the insides of their Halloween pumpkins. Although ‘carving pumpkins’ are bred and grown specifically for carving and tend to be more watery and less flavourful than the more edible sugar pumkins, they can still be consumed. Here are some ideas for turning your fresh pumpkin guts into something tasty…. Make pumpkin soup, pumpkin pie or pumpkin cupcakes for family, friends, neighbours or even for a local homeless person - I’m sure they would really appreciate a hot cup of pumpkin soup. Check out this link for some cool recipes - Save the Guts! - 11 ways to eat your Halloween Pumpkin Carvings. Dry out pumpkin seeds to eat, if you don’t like them you can always leave them out to feed birds and squirrels. Famous Chef Jamie Oliver gives you steps on how to roast your seeds here. Either chop the remains of the pumkin into pieces or leave whole and put at the end of the garden or in a nearby forest for the local wildlife to feast on. Compost the remnants of the pumpkin, put in your food waste bin, check with neighbours who may own an allotment or donate to a local farm or zoo for the animals to feed on. Do not send to landfill!! If you have the time and the inclination, have a go at making a costume, there are plenty of online resources to help you do so. Scour your local second-hand shops, sometimes they have used costumes or with a bit of imagination, you can pick up a few separates to put together a whole new outfit. Use what you already have or swap costumes/clothes with friends and family to come up with something new. Rent costumes from your local costume hire shop. Dress in black, red or purple and paint your face instead of forking out on new clothes. If you choose to buy new, then buy from ethical retailers and try to buy something that you will wear again. There are plenty of ideas for DIY costumes and face painting on the internet especially on Youtube and Pinterest. Most Halloween accessories and decorations are plastic and are hard to recycle or end up in landfill - to avoid this, why not get creative and have a go at making your own, you can check out the local secondhand shops too, they often have some donated Halloween paraphernalia. Bulk buy sweets at whole foods or your nearest bulk or zero-waste store and wrap in little recyclable/compostable paper bags. Many bigger chocolate bars have foil and paper or cardboard packaging. Break the chocolate into pieces and add to your paper candy bags. If you don’t have a zero-waste or whole food store near you then check out these goodies below from brands who are using mostly earth-friendly packaging. Some are using recycled plastic or are in the processs of phasing out plastic completely, whilst others are already using compostable materials. Supporting these brands means supporting the move towards living plastic-free. There are packaging details besides each product. Fairtrade and Organic Vegan Chocolate. Their cardboard is 100% recyclable, with all plastic to follow by the end of the year. They choose ethical locally sourced packaging to reduce their carbon footprint throughout the business. You will receive a wonderful cardboard box which will hold your lovingly handmade products. Don't be surprised if your cardboard box looks like it had a previous life, as they try their best to reuse their boxes wherever possible to give them a long happy journey. You can also recycle or reuse the boxes, giving it a whole new purpose. You may see EcoFlo in your packaging. This is NOT polystyrene, it's 100% recyclable! EcoFlo is Made from sustainable raw materials. EcoFlo is compostable and a great environmentally friendly product. Fairtrade and Organic Vegan Chocolate. The cardboard is 100% recyclable, with all plastic to follow by the end of the year. 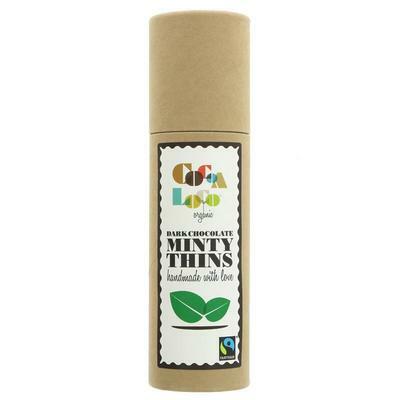 Ethical locally sourced packaging is used to reduce their carbon footprint throughout the business. You will receive a wonderful cardboard box which will hold your lovingly handmade products. Don't be surprised if your cardboard box looks like it had a previous life, Cocoa Loco try their best to reuse their boxes wherever possible to give them a long happy journey. You too can recycle or reuse the boxes, giving it a whole new purpose. A terribly tasty Halloween treat. A Vegan Round Up filled with seriously tangy blackcurrant jam. Encased in foil and cardboard packaging - recyclable. Ananda’s packaging is recycled and recycle-able. They recycle 90% of their waste and re-use outer packaging wherever possible. Get your fangs into these mini bites of vanilla marshmallows. Perfect for your little trick or treaters! Ananda’s packaging is recycled and recycle-able. They recycle 90% of their waste and re-use outer packaging wherever possible. Minimal plastic use and use recycled where possible. Fruity snacks made from ‘imperfect’ fruit that would otherwise have been discarded. Not only do they prevent food waste but SNACT also use Plastic-free Home Compostable packaging. In addition to being Vegan these delicious bars are organic, fair trade and gluten-free too! Packaged in recyclable card. 100% of Alter Eco products are sourced directly from small-scale farmers. Beyond paying the Fair Trade premium every year, they provide their partners with targeted assistance for concerns such as food security, biodiversity and gender equality. In a joint effort with PUR Projet, Alter Eco have been working with their cacao partner, Acopagro Coop, to replant and conserve a portion of the Peruvian Amazon. The number of trees they plant each year accounts for more than 100% of Alter Eco’s carbon expenditure.Launching the world’s first compostable, non-GMO, non-toxic candy wrappers, and inventing the world’s first compostable stand-up pouch made from renewable, plant-based, non-GMO materias: they are working towards 100% compostable packaging and are part of a coalition to encourage the rest of the industry to follow suit. The likelihood is that you will have more control over what treats you hand out than what your children may bring home, so if at the end of the day you still end up with a load of candy wrappers, you can either use them with your kids in craft projects or donate them to a local school to be used for crafts. Another option is to send them to Terracycle who collect non-recyclable or difficult to recycle materials where it gets upcycled into other things.